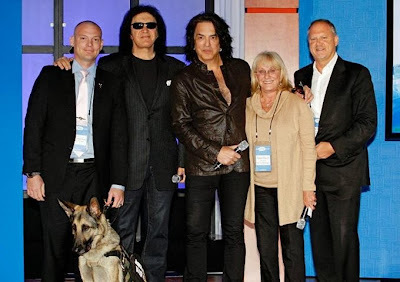 Paul Stanley & Gene Simmons attended the CMO Club Summit today, to show their support for K9s for Warriors program. The CMO Club donated $20k to the program at the event! In the photo: Captain Jason Haag and his Dog, Gene Simmons, Paul Stanley, Shari Duval, and Founder of The CMO Club, Pete Krainik.